Each person in the United States creates about a ton of garbage per year. That's a total of over 389 million tons of garbage every year. 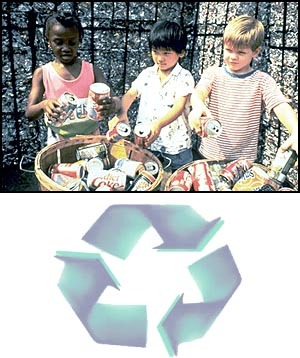 Most cities have recycle programs for cans bottles, paper, boxes and other materials. Go to the site at Earth911.org and enter your zip code to find out how you can recycle in your community. Avoid using products that are over-packaged. Use rechargeable batteries and reusable items as much as possible. Cut down on the amount of garbage you create. People in Hawaii can call 527-5335 for recycling information. Or go to Opala.org for information about recycling and waste disposal in Hawaii.